Stacey Fox-Alvarez, DVM, MPH, is an emergency and critical care specialty intern with University of Florida, where she earned her DVM and a master’s degree in public health. Her primary areas of interest are medical oncology and oncologic emergencies. She completed a small animal rotating internship with Affiliated Veterinary Specialists in Maitland, Florida. Amara Estrada, DVM, DACVIM (Cardiology), is a professor of cardiology and the associate chair for instruction in the department of small animal clinical sciences at University of Florida, where she also earned her DVM. Dr. Estrada completed a cardiology residency at Cornell University. She frequently speaks at continuing education meetings nationally and internationally. Her research interests include inherited cardiomyopathies and interprofessional education. How do I calculate a vertebral heart scale (VHS)? The vertebral heart scale system (ie, vertebral heart size) was developed as a means to objectively evaluate cardiac size among dogs of different breeds and thoracic conformations. Already a pro at measuring VHS? Take our VHS quiz here! The VHS was established to create a more objective way of diagnosing cardiomegaly via thoracic radiography. Individual dogs can have values that fall outside of the normal range without cardiac disease, so it should not be used as the only means of diagnosing cardiac disease in any given patient. In addition to a thorough history and physical examination, VHS can be used to raise clinical suspicion of heart disease. VHS is useful for monitoring a patient in which heart disease is suspected (Figure 1), or in tracking changes in progressive cardiac disease over time. Figure 1 Illustration of VHS calculation in a normal dog. On a lateral radiograph, a line is drawn from the carina to the most ventral aspect of the heart. This line is the “L” or long axis line. A line is drawn perpendicular to the long axis at the widest portion of the heart, extending to the cranial and caudal borders. This is the short axis or “S” line. These lines are transposed using calipers extending along the spine from the cranial aspect of T4. The number of vertebrae traversed (rounded up to the nearest tenth) are added together for the VHS. VHS has been shown to correlate with other means of measuring cardiomegaly (ie, ECG, echocardiography) in dogs with progressively increasing heart size, and it is considered by some to be the gold standard in determining cardiomegaly in dogs.1 The authors believe many dogs with presumptive MVD can be managed effectively by use of a thorough physical examination and basic diagnostics, such as a VHS and measurement of blood pressure. As guidelines for the treatment of heart disease in veterinary medicine evolve, it will become increasingly important to accurately stage patients with these conditions to determine when medical treatment is indicated. VHS calculation can be an important component to the staging of cardiac disease. ACE inhibitors are currently recommended for these patients by some specialists, as well as the majority of the members of the ACVIM consensus panel for MVD.6 As more studies evaluate the use of medical intervention to delay the onset of CHF in dogs with preclinical cardiac disease, treatment recommendations will continue to change. The ACVIM consensus statement on degenerative MVD recommends baseline thoracic radiography for dogs with a new murmur, then annually thereafter.6 For practitioners adhering to these guidelines, annual calculation of VHS and rate of change from previous imaging should become standard practice and may help identify those patients at higher risk of developing CHF in the coming year. Figure 2 illustrates annual radiographs taken in a patient with progressive cardiomegaly. Figure 2A Progressive cardiomegaly noted on annual evaluations in a dog with MVD. Figure 2B Progressive cardiomegaly noted on annual evaluations in a dog with MVD. Figure 2C Progressive cardiomegaly noted on annual evaluations in a dog with MVD. The VHS has been shown to be useful when determining whether a cough is cardiogenic, pulmonary, or mixed in origin for dogs with MVD.9 One study found that a VHS >12.0 was suggestive for a cardiac component to cough in dogs with MVD.9 It is important to note that among these dogs, some were determined to have a cough of mixed cardiac and pulmonary origin. The original guidelines for VHS were designed to be applicable across breeds and conformations, and most dog breeds studied individually fall within the normal range. However, several breeds have normal VHS values that would suggest cardiomegaly using the original scale. Of the breeds evaluated to date, the boxer, bulldog (French and English), Boston terrier, Cavalier King Charles spaniel, Labrador retriever, pug, Pomeranian, and whippet have been found to have average values that are much higher than other dog breeds. New sets of normal values have been developed for use in these breeds12-14 (Table). To calculate a VHS, a lateral thoracic radiograph in right or left lateral recumbency is needed. If using plain films, calipers or a ruler will be necessary to hold the measurements. If using digital films, calipers or electronic calipers can be used. The best possible technique and positioning of the patient should be used to prevent rotation from affecting measurements and to make serial imaging comparisons more reliable. Using the calipers, measure the long axis of the heart from the carina to the apex of the heart at its most ventral point. Measure the heart at its widest point (ie, the short axis) perpendicular to the line drawn for long axis. To calculate the vertebral heart scale, add the “L” and “S” measurements together. Right or left lateral recumbency is acceptable. If taking serial images, they should be done using the same side. The long axis should be drawn from the level of the carina. The short axis should be perpendicular to the long axis. Typically, a value of <8 for cats is used for convenience (normal, 6.7-8.1). A value >8 indicates cardiomegaly, which may indicate underlying pathology. In cats, normal VHS does not rule out heart disease or dysfunction, as diseases that produce concentric hypertrophy (eg, hypertrophic cardiomyopathy) will not necessarily be accompanied by an enlarged cardiac silhouette. Interobserver variability is a known factor affecting consistent measurement of a VHS. 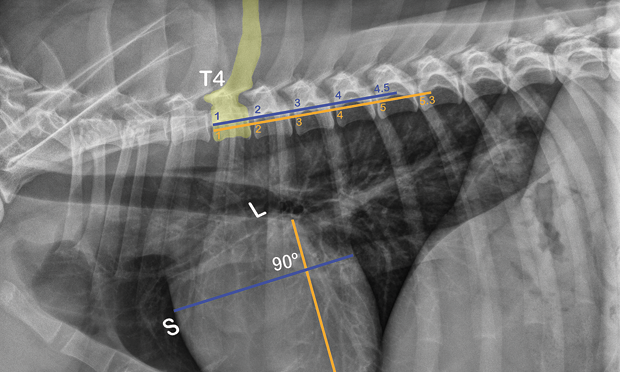 One study showed an average difference between individuals of around 1 vertebrae when evaluating the same films.16 Ideally, the same veterinarian should calculate the VHS at all time points for an individual patient when tracking changes. Pericardial effusion has been shown to cause an increased VHS result. 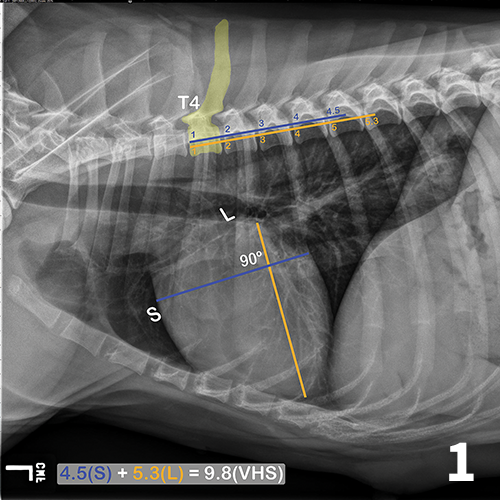 In 1 study, the majority of dogs with pericardial effusion had a VHS >12.0.17 This should be a consideration for any dog with a generalized cardiomegaly on thoracic radiography. A thorough physical examination and history can help to rule this condition in or out as a cause for exercise intolerance, lethargy, collapse, ascites, or other similar signs. Right vs left lateral recumbency may impact the VHS. 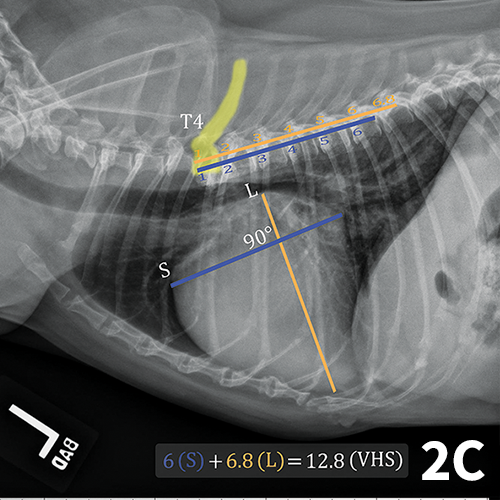 Several studies have shown no difference between measurements, while others have shown that dogs in right lateral recumbency have higher VHS values (by approximately 0.3 vertebrae).1,4,21,22 This suggests that serial measurements of the same patient should be performed with consistent positioning; however, this may not be clinically significant. It is important to note that a normal heart size on thoracic radiography does not rule out cardiac disease or dysfunction. The VHS is a valuable tool to assess cardiac status and should be used in conjunction with other diagnostics (ie, physical examination, history, resting respiratory rate, ECG, NT-proBNP, echocardiography) to determine if treatment for cardiac disease is warranted or if further testing is needed based on clinical suspicion of cardiac involvement in disease. Nakayama H, Nakayama T, Hamlin RL. Correlation of cardiac enlargement as assessed by vertebral heart size and echocardiographic and electrocardiographic findings in dogs with evolving cardiomegaly due to rapid ventricular pacing. JVIM. 2001;15(3):217-221. Summerfield NJ, Boswood A, O’Grady MR, et al. Efficacy of pimobendan in the prevention of congestive heart failure or sudden death in Doberman pinschers with preclinical dilated cardiomyopathy (the PROTECT Study). JVIM. 2012;26(6):1337-1349. O’Grady MR, O’Sullivan ML, Minors SL, Horne R. Efficacy of benazepril hydrochloride to delay the progression of occult dilated cardiomyopathy in Doberman pinschers. JVIM. 2009;23(5):977-983. Kvart C, Häggström J, Pedersen HD, et al. Efficacy of enalapril for prevention of congestive heart failure in dogs with myxomatous valve disease and asymptomatic mitral regurgitation. JVIM. 2002;16(1):80-88. Pouchelon JL, Jamet N, Gouni V, et al. Effect of benazepril on survival and cardiac events in dogs with asymptomatic mitral valve disease: A retrospective study of 141 cases. JVIM. 2008;22(4):905-914. Atkins C, Bonagura J, Ettinger S, et al. Guidelines for the diagnosis and treatment of canine chronic valvular heart disease. JVIM. 2009;23(6):1142-1150. Lord P, Hansson K, Kvart C, et al. Rate of change of heart size before congestive heart failure in dogs with mitral regurgitation. J Small Anim Pract. 2010;51(4):210-218. Lord PF, Hansson K, Carnabuci C, Kvart C, Häggström J. Radiographic heart size and its rate of increase as tests for onset of congestive heart failure in Cavalier King Charles spaniels with mitral valve regurgitation. JVIM. 2011;25(6):1312-1319. Guglielmini C, Diana A, Pietra M, Di Tommaso M, Cipone M. Use of the vertebral heart score in coughing dogs with chronic degenerative mitral valve disease. J Vet Med Sci. 2009;71(1):9-13. Sleeper MM, Roland R, Drobatz KJ. Use of the vertebral heart scale for differentiation of cardiac and noncardiac causes of respiratory distress in cats: 67 cases (2002-2003). JAVMA. 2013;242(3):366-371. 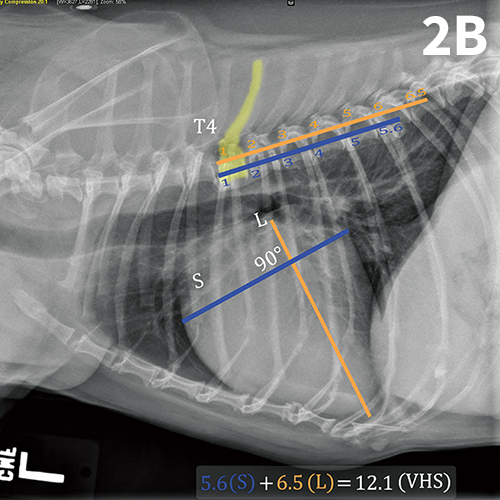 Buchanan JW, Bücheler J. Vertebral scale system to measure canine heart size in radiographs. JAVMA. 1995;206(2):194-199. Jepsen-Grant K, Pollard RE, Johnson LR. Vertebral heart scores in eight dog breeds. Vet Radiol Ultrasound. 2013;54(1):3-8. Lamb CR, Wikeley H, Boswood A, Pfeiffer DU. Use of breed-specific ranges for the vertebral heart scale as an aid to the radiographic diagnosis of cardiac disease in dogs. Vet Rec. 2001;148(23):707-711. Bavegems V, Van Caelenberg A, Duchateau L, Sys SU, Van Bree H, De Rick A. Vertebral heart size ranges specific for whippets. Vet Radiol Ultrasound. 2005;46(5):400-403. Litster AL, Buchanan JW. 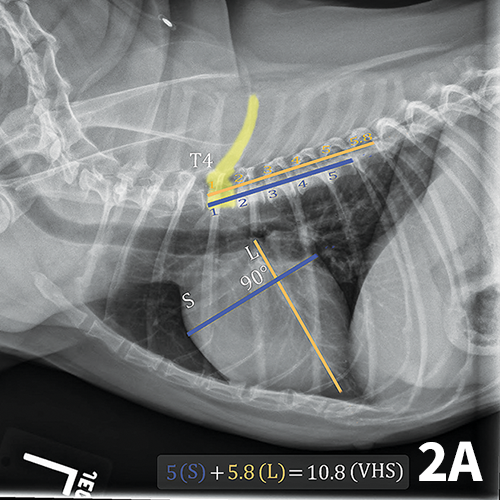 Vertebral scale system to measure heart size in radiographs of cats. JAVMA. 2000;216(2):210-214. Hansson K, Häggström J, Kvart C, Lord P. Interobserver variability of vertebral heart size measurements in dogs with normal and enlarged hearts. Vet Radiol Ultrasound. 2005;46(2):122-130. Guglielmini C, Diana A, Santarelli G, et al. Accuracy of radiographic vertebral heart score and sphericity index in the detection of pericardial effusion in dogs. JAVMA. 2012;241(8):1048-1055. Wilson HE, Jasani S, Wagner TB, et al. Signs of left heart volume overload in severely anaemic cats. J Feline Med Surg. 2010;12(12):904-909. Levine HJ, Wolk MJ, Keefe JF, Bing OH, Snow JA, Messer JV. Myocardial mechanics and energetics in experimental iron-deficiency anemia. Am J Physiol. 1977;232(5):H470-H477. Anand IS, Chandrashekhar Y, Ferrari R, Poole-Wilson PA, Harris PC. Pathogenesis of oedema in chronic anaemia: Studies of body water and sodium, renal function, haemodynamics and plasma hormones. Br Heart J. 1993;70(4):357-362. Greco A, Meomartino L, Raiano V, Fatone G, Brunetti A. Effect of left versus right recumbency on the vertebral heart score in normal dogs. Vet Radiol Ultrasound. 2008;49(5):454-455. Gordon SG, Saunders AB, Hariu CD, Boggess MM, Miller MW. Retrospective review of carvedilol administration in 38 dogs with preclinical chronic valvular heart disease. J Vet Cardiol. 2012;14(1):243-252.